Although we didn’t get to the deep south of our American trip late last year we did get to experience a Jambalaya and I have to say it was a very soul filling food. So it was added to the must remake when home again! I would love to try some different variations on this as well. Here is my thermomix Chicken & Chorizo Jambalaya. I trust you will enjoy as much as I did. If you’ve never had a Jambalaya before it’s basically a spicy rice dish, filled with chorizo and all different types of vegetables in a tomato sauce. I had originally thought that it was more like a gumbo and had to cook for hours and hours, but after a little google searching – wowsers! quick, simple, cheap and full of flavour! Ticked all the boxes! Make ThermoFun Cajun Spice and set aside. Combine the chicken with 1 Tbsp Cajun Spice and set aside. Wet and squeeze a sheet of baking paper. Line the upper layer of the Varoma tray. Twist the corners of the paper to make a shallow ‘bowl’ shape and place chicken onto the baking paper ‘bowl’. Be sure to keep the side vents exposed so steam can circulate freely. Place garlic, onion, ½ Tbsp Cajun spice and stock into TM bowl and chop 3 sec / speed 5. Scrape down. Add chorizo and sauté 5 mins / Varoma / speed 1 / Reverse / MC off. Add tomatoes and heat through 2 mins / Varoma / speed 1 / Reverse. Set aside in a preheated ThermoServer to keep warm. Pour boiling water into TM bowl. Weigh rice in simmering basket and rinse under cold tap until water runs clear. Carefully insert basket into TM bowl. Place assembled Varoma tray onto TM lid and cook 13 mins / Varoma / speed 1. Add capsicum and lime juice to Varoma and cook 5 mins / Varoma / speed 1. Once the steaming has completed, add the rice to ThermoServer and combine with tomatoes and chorizo mix. Stir through coriander/parsley (leaving a little aside to garnish). 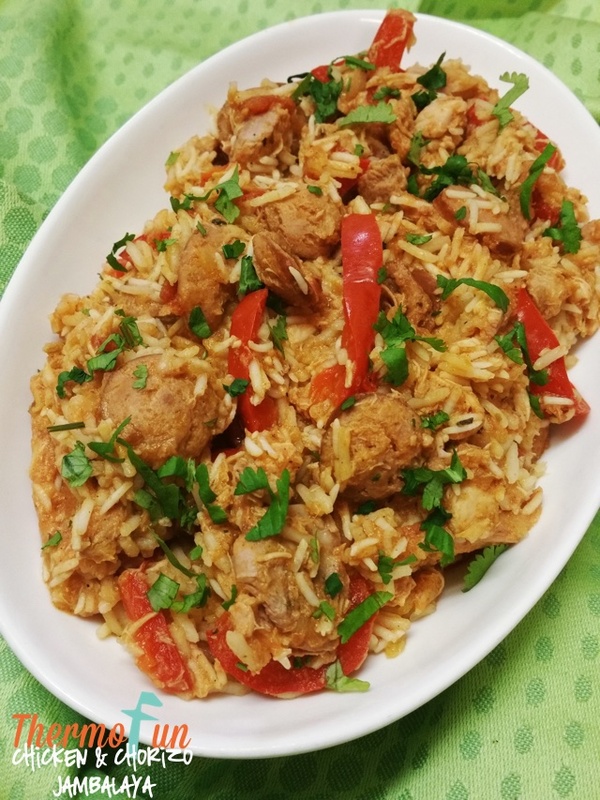 Serve rice with chicken and garnish with coriander or parsley. Thanks Mark, I do agree! Will the rice get mushy, rather than separated grains? That’s so awesome to hear Melissa, yes it is a dish that needs to be out of the machine in a hurry or it gets sticky. But yah for your 10 yr old pushing through! Mine was nothing like the picture, the rice totally smushed esp. at the bottom. What did I do wrong? Is it definitely Basmati? Despite that it was delicious – next time I’ll try leaving out the rice and water and then serve on steamed rice. (Maybe try arborio rice for a more risotto like meal too). oh no Amy 🙁 Yes it is definitely basmati. I did have issues with this recipe in the testing stages, but finally perfected it. So I’m wondering perhaps brands of basmati differ??? Easy and get to use the barons which I don’t do as often as I should! Love the Cajun spice mix!